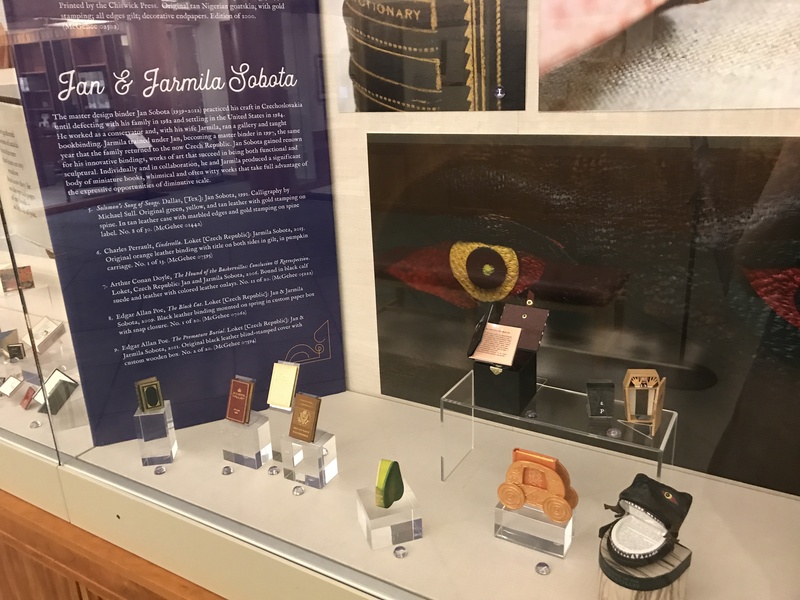 If you come by Special Collections this summer, you are in for a bibliographical and visual feast! 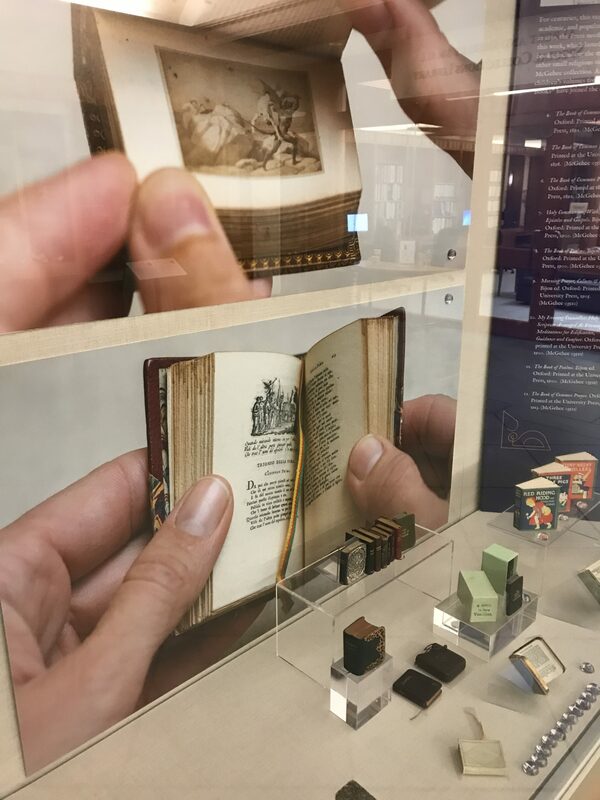 Our new exhibition, “Eminent Miniatures: from the McGehee Miniature Book Collection” features tiny books and huge photographs. 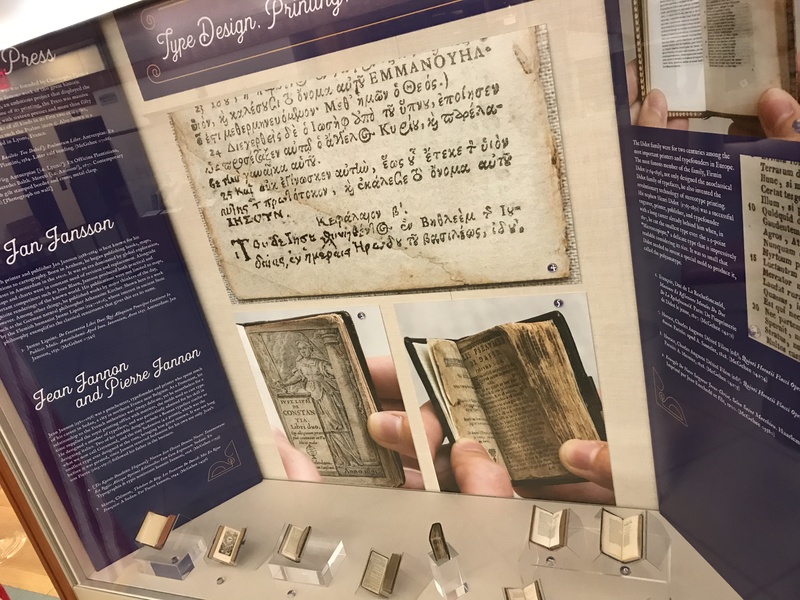 The exhibition is in the First Floor Gallery of Harrison/Small, just outside the Special Collections reading room. 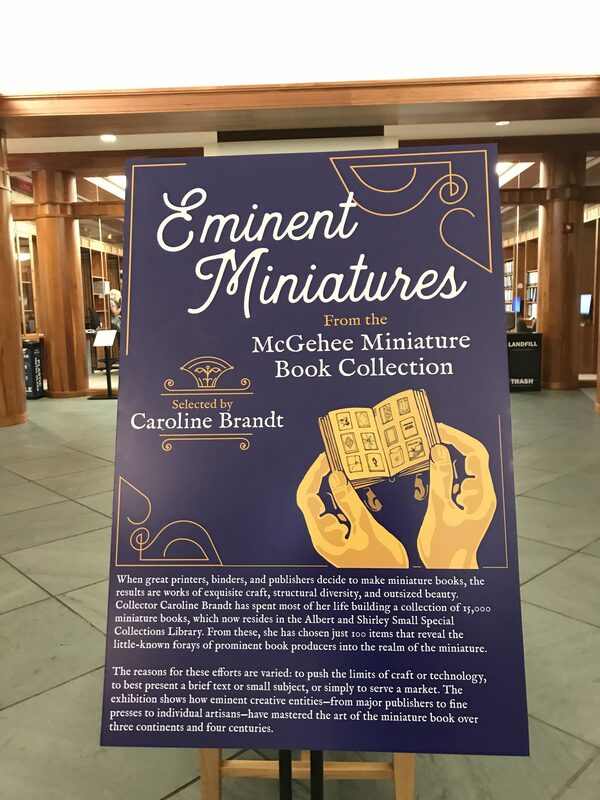 Collector Caroline Brandt has spent most of her life building a collection of 15,000 miniature books, which now resides in the Albert and Shirley Small Special Collections Library. From these, she has chosen volumes that reveal the little-known forays of prominent book producers into the realm of the miniature. 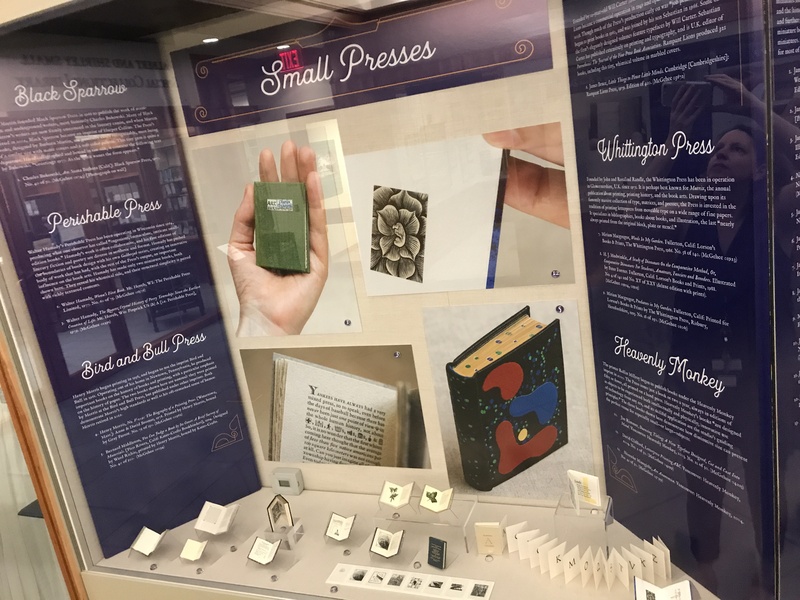 In this exhibition, you will see that when great printers, binders, and publishers decide to make miniature books, the results are stunning. These are works of exquisite craft, structural diversity, and outsized beauty. 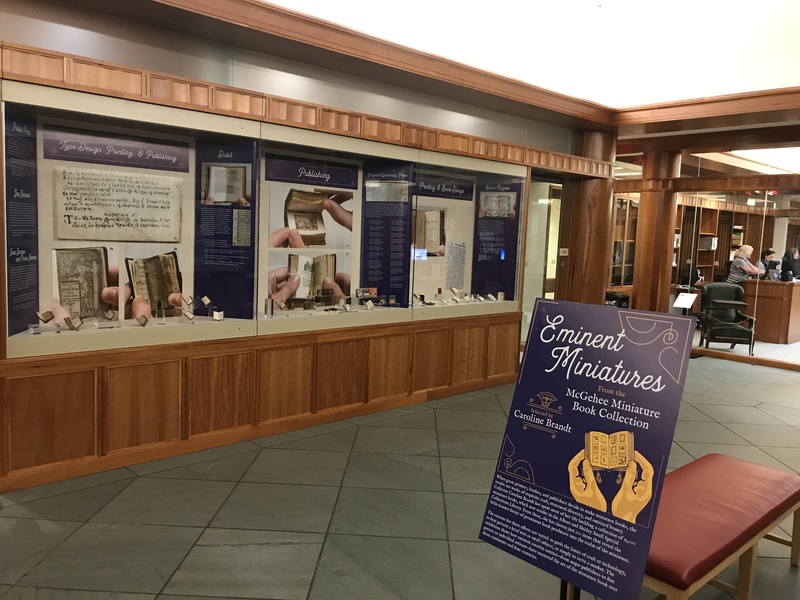 The exhibition has been mounted in conjunction with the upcoming Grand Conclave of the Miniature Book Society, which will be held in Charlottesville in August. The exhibition runs through August 26. Don’t miss it! The exhibition opens with some of our greatest miniature treasures from early presses such as Plantin and Jannon. In this section dedicated to Publishers, large images of landmark nineteenth-century Italian miniatures loom over a selection of Oxford University Press publications, including religious volumes and children’s books. 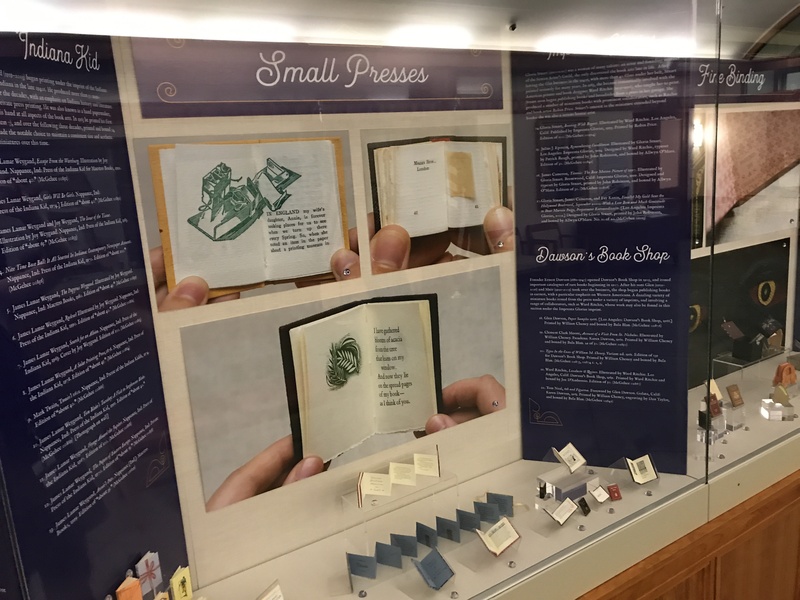 The exhibition features the miniature output of a number of small presses, some of which are on view in this case. Miniature books require that fine binders exercise their skills in new ways to ensure that small volumes open and close smoothly. Despite the additional challenges, some art binders have embraced the miniature. Miniature books come in a dazzling array of structures. In many cases, the diminutive size and light weight of the books means that it is possible to display accordions and other formats open. Oversized images are near the books they represent, allowing visitors to view and appreciate their artistry with rare immediacy. Overview of the first half of the exhibition. Overview of the second half of the exhibition. Thanks to the talented Shane Lin for his elegant photographs of miniature books, which form the backdrop of the exhibition cases shown here. 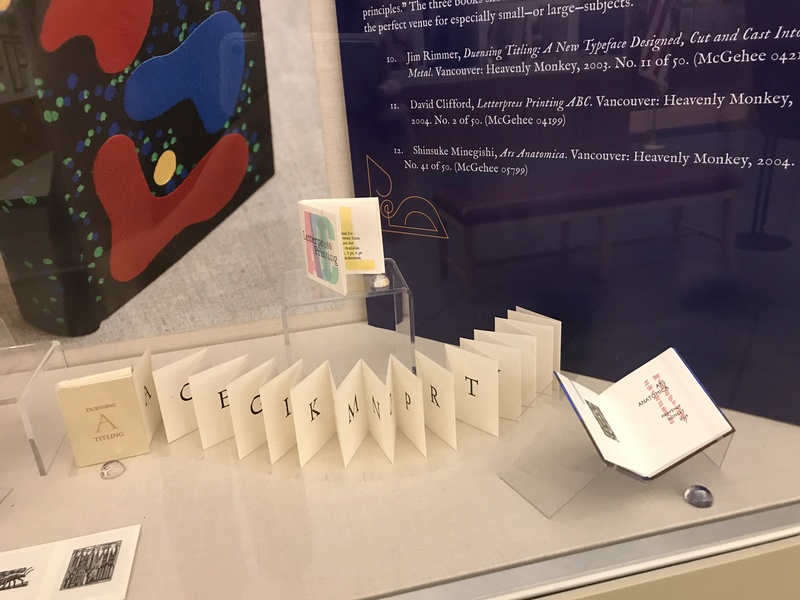 This entry was posted in Exhibitions and tagged fine press, McGehee Miniature Book Collection, rare books, Shane Lin, small press by Molly Schwartzburg. Bookmark the permalink. These look gorgeous and you sound amazing Thank you for sharing. Molly and Caroline- this is spectacular! Love the use of the enlarged photos! Can’t wait to see it in August. Well done, ladies! 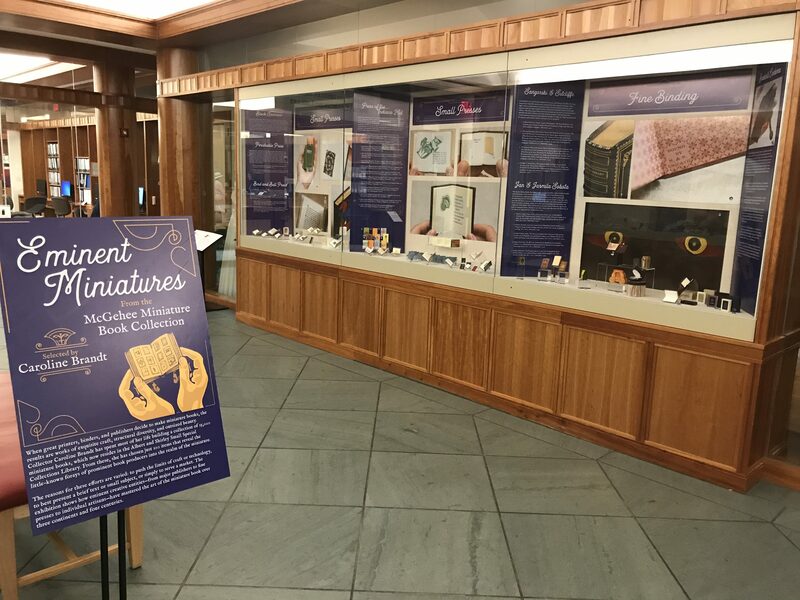 Thank you for sharing this beautiful article about the McGehee Miniature Book Collection. Caroline Brandt is my beloved step-mother, and I am so proud of her creative accomplishments as well as her extraordinary generosity. Martha, thank you so much for your comment! I hope you have a chance to come by and see the show before it closes.